Have you ever wondered what the weather was like the day Hamlet premiered? Or what about the week that Spanish explorer Gaspar de Portola and his crew became the first Europeans to lay eyes on San Francisco Bay? Neil Tangri is developing a new way to look for clues about ancient weather. He and his colleagues at the Stanford Linear Accelerator Center, also known as SLAC, are using a synchrotron – one of the world’s most powerful X-ray machines – to look deep inside coral skeletons. “We’re trying to get a sense of long term behavior of ocean temperature and precipitation,” Tangri says. Corals are unusual creatures. Tiny animals called polyps form an exoskeleton to live in. When one polyp dies, another builds a new home from calcium carbonate right on top of the old one. Beneath lies the abandoned exoskeletons, like an ancient city made of layer upon layer of old dwellings. The coral that Tangri and his colleagues are taking X-rays of is Porites lutea from American Samoa. 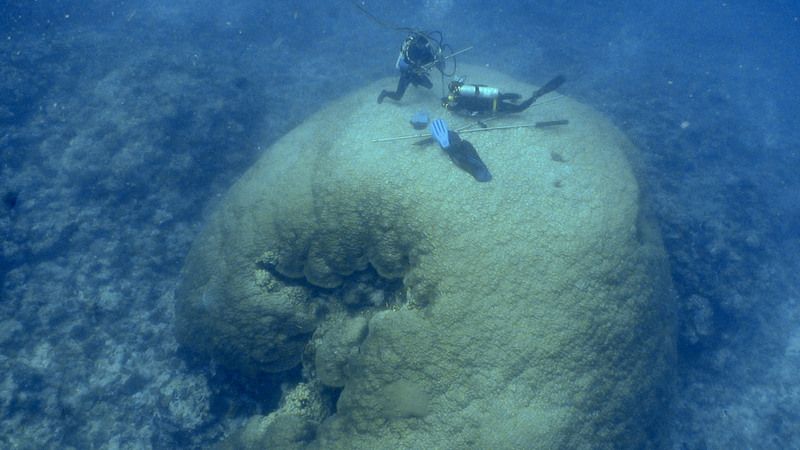 In the wild, these helmet-looking coral grow to be very large and very old. The samples that Tangri is imaging are only about 15 inches long, but the original core is 18 feet long and nearly 500 years old. Detailed written weather records have only been around for about 150 years. Since Tangri’s coral sample is much older, he can draw conclusions about the weather long before measurements were being written down. More importantly, Tangri can look for patterns in the data that can help them understand complex issues today. Worldwide weather patterns tend to happen in cycles. Take El Niño, California’s sorely missed rain delivery system, which normally occurs every 2 to 7 years. Or the Pacific Decadal Oscillation, a similar, but long-term phenomenon which cycles roughly every 25 years and can have major affects on the weather. Combing through old weather data can only get you so far, so scientists are increasingly looking at climate proxies – like corals, tree rings and ice cores – to paint a clearer picture of ancient climate. Corals gather an incredible amount of data and we’re just now figuring out how to unlock it. To tease out clues, Tangri is taking advantage of a biological quirk in hard corals. Coral exoskeletons are mostly made of calcium carbonate. But sometimes the polyps incorporate tiny amounts of other elements from the surrounding water, including strontium. Biologists don’t fully understand why polyps absorb strontium, but it’s a phenomenon that happens consistently across the world’s oceans. When sea surface temperatures are warmer, corals absorb less strontium into their exoskeletons. When they are colder, they absorb more. By comparing the strontium-to-calcium ratio over time, Tangri and his team are able to reconstruct sea surface temperatures. They also can chart long-term cycles that occurred over the lifespan of the coral. “The advantage of 500-year-old corals is that you can look at many 25-year weather cycles,” Tangri says. “We’re not the first to X-ray corals, but I believe we’re the first to look at strontium-to-calcium ratio within the exoskeleton,” he adds. To be able to look for such tiny chemical changes in the coral, Tangri needed to try a new way of looking coral skeletons. Stanford’s synchrotron works by accelerating particles along a circular track to 99.99% the speed of light. At that speed, electrons whip off of the atoms and form an intense X-ray beam. In fact, it’s one billion times brighter than a hospital X-ray machine. The operation looks like a scene from Dr. Strangelove, and has a distinctly Cold War feeling about it. When Neil and his colleague Apurva Mehta are ready to make a scan, they have to go step-by-step through the arming procedure, which includes shutting a large steel door and two keys, to start the X-ray. The ultra-high resolution of the synchrotron X-ray allows Tangri to see with incredible detail – down to the chemical make up of the exoskeleton. “We have a spatial resolution of about 10 microns,” Tangri says. That means he can see how the coral grew almost down to the week. Tangri’s goal for analyzing corals extends beyond filling in some blanks about ancient weather. He says that he hopes to further refine the imaging process to be able to answer specific questions about weather patterns, like when the monsoons arrive in India. Nearly a billion people there rely on the rain to grow their crops. To find that out, Tangri is looking for an element that indicates precipitation. Barium is commonly found in soils on land. When it rains, soil washes from into the ocean, where the corals absorb some of it into their exoskeletons. If there’s a significant rise in barium, it can indicate when it rained a lot – like a monsoon. He has already been able to chart the arrival of the monsoons in East Africa from another sample taken near Kenya. “Corals gather an incredible amount of data and we’re just now figuring out how to unlock it,” Tangri says.